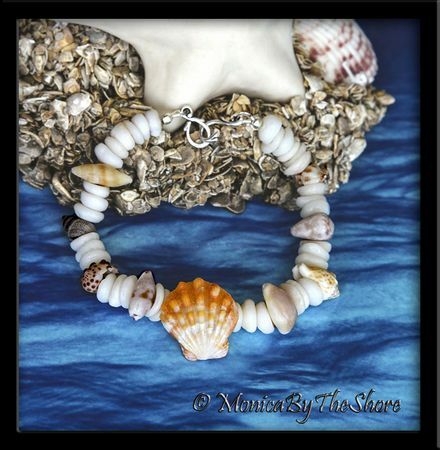 Hawaiian Sunrise Shell with washed up North Shore Puka Shells and a collection of Ke Iki Beach Seashell bracelet! Centered around a beautifully colored, pristine orange & white, 1 inch Hawaiian Sunrise Shell, these surrounding little North Shore seashells and Puka Shells are a shell collection to make a truly one-of-a-kind piece of Sunrise Shell jewelry, "Wearable Aloha". You will love wearing this unique island style bracelet with its variations of colors, textures & patterns. Bracelet is 7 1/2 inches and is finished with a decorative sterling silver vine hook clasp. You won't keep your eyes off this sweet bracelet! 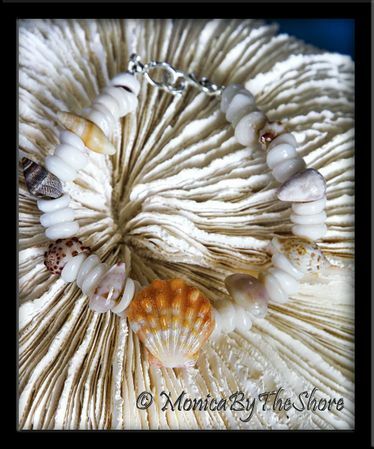 An original MonicaByTheShore Seashell jewelry design, created with lots of Aloha & Love, on the North Shore of Oahu in Haleiwa, and Honolulu, Hawaii.